Programmatically accessing Flow, including the underlying administrative capabilities has been a key ask from many customers. As Microsoft Flow adoption increases and subsequently the number of environments, providing automation has been an important capability to deliver for our customers. As part of our investments to support GDPR Data Subject Rights (DSR) requests, the Microsoft Flow and PowerApps teams released a set of PowerShell cmdlets. These cmdlets provide value beyond GDPR data subject rights requests and also allow users and tenant administrators to automate many Application Lifecycle Management (ALM) and administrative tasks. For more specific details and examples of how to call these PowerShell cmdlets, please refer to the following blog post. Earlier this year we released a Microsoft Teams app that included a Flow bot. To access the Flow bot, first add the Flow app to Microsoft Teams – you can read more about that here. Once you have added the Flow app, you can go to the Conversation tab and start typing. The Flow bot could be used to trigger any scheduled flow on-demand. For example, you could have a weekly report that emails your organization. Wtih the Flow bot, you could also send out that report from inside Teams. Now, we have added the ability to run any Flow button that doesn't take any additional inputs. For example, you could create a Flow button that blocks out your calendar for the rest of the day. You can now run that flow by typing Run flow 1 in the Conversation tab. In addition, the Flow bot can now describe the Flows that it can run: type Describe flow 1 (or whatever the number is) will show you the description of that flow. Marketo – Marketo© is a marketing automation platform that enables marketers to manage personalized multi-channel programs and campaigns to prospects and customers. ElasticOCR – The new, modern way to OCR your documents. DynamicSignal – Dynamic Signal is an Employee Communication and Engagement Platform, trusted by organizations to connect, align and engage employees. Connect to Dynamic Signal to create and manage your posts and users. When you share — or run shared — flows, it's important that you know exactly what will happen. We have added some additional information to these two gestures to provide you more visibility into exactly what permissions other people will receive because of sharing (or running a shared flow). Now, we will automatically trim the above URL to be just https://contoso.sharepoint.com/teams/pmteam/. All you need to do is select Enter custom value, and then paste in the URL. After a moment it will automatically be shortened to just contain the site portion of the URL. The GDPR gives rights to people, known as data subjects, to manage the personal data that has been collected by an employer or other type of agency or organization, also known as the data controller. Microsoft has invested in both tools and processes that allow data controllers to respond to Data Subject Rights (DSR) requests. For enterprise organizations receiving DSR requests from Azure Active Directory (AAD) data subjects, a comprehensive toolset and guide has been developed that allow organizations to respond to Microsoft Flow DSR requests. 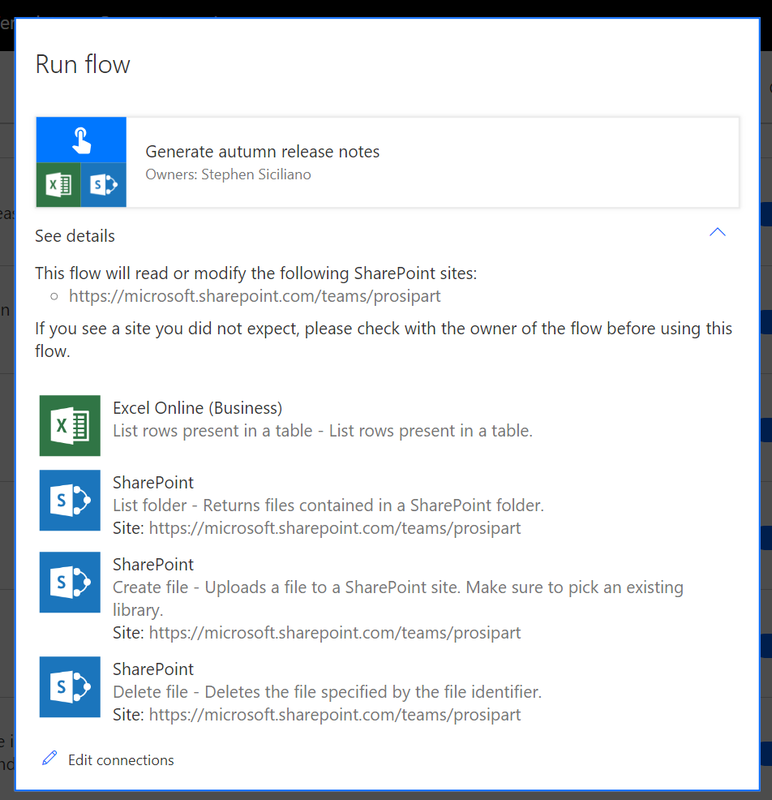 Within this guide, specific guidance has been provided for Microsoft Flow that allows data controllers to Discover, Access, Rectify, Restrict, Delete and Export personal information. Within this guide, specific instructions are provided for tenant administrators that allow data controllers to execute DSR requests. Alternatively, you may determine the request doesn't meet your organization’s guidelines for responding to DSRs and perform no additional actions. 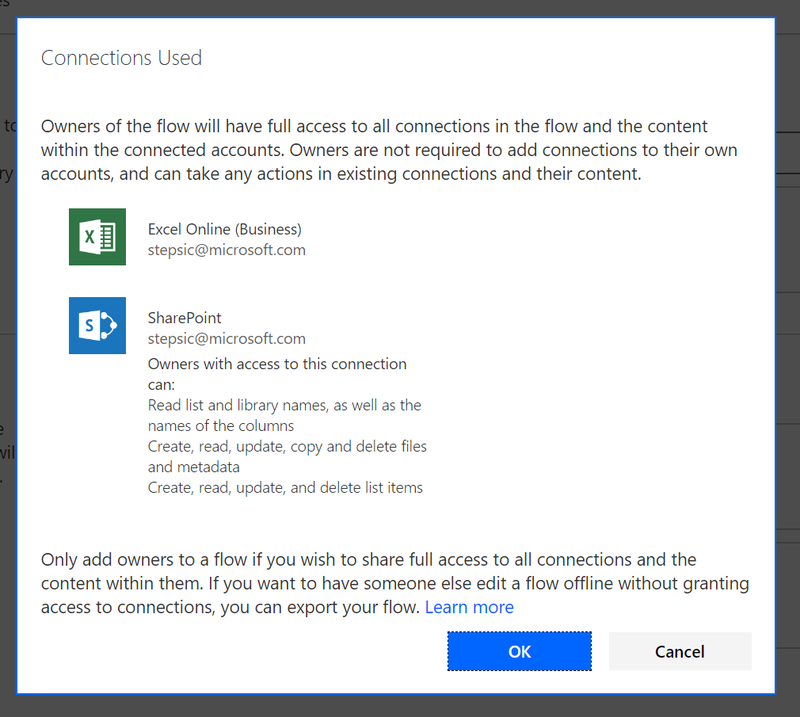 Similar to enterprise organizations, a Microsoft Flow account that has been setup using a Work or School account may follow the steps that are performed in the enterprise guide. Any steps that require alternative considerations are called out within the guide. Individuals may also have access to Microsoft Flow using their Microsoft Account (MSA). Support for DSR requests are also provided by Microsoft, but the steps are different since there is not a tenant administrator in MSA scenarios. In addition, MSA accounts do not support as many features as enterprise licenses. As a result, there are fewer places where personal data is stored. For more information related to DSR requests for MSA accounts, please the following guide.